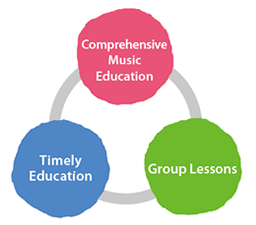 Group Lessons: Teacher + Children + Parents Lessons are taught to a group of students (typically 8 to 10 per class) and, in the case of the Music Wonderland and Junior Music Course, one parent attends with each child. This format motivates children and provides an opportunity to develop ensemble skills and cooperation within a supportive community of friends and parents. With their peers, children become part of a musical team making music together. With their teacher and parents, the group becomes a musical community. The group format, in conjunction with the musical content, brings joy and fun to the learning process. Students who attend class with their friends have extra-musical reasons to return every week. The camaraderie that grows contributes to tight, expressive ensemble performances at advanced levels and promotes long-term involvement in music. Parental attendance facilitates accelerated growth. The parent/child partnership is active, not passive. Each partnership develops into a mini-ensemble, where co-learning, co-practicing and co-discovering can be enjoyed in class and at home. The entire family hears music shared between two members and often is motivated to join in the fun. In fact, when younger siblings of students become students themselves, we often find their sense of pitch is more developed than that of other entering students. They have heard the language of music at home and already have begun to absorb it. Comprehensive Music Education The JMC curriculum is broad compared to typical private piano lessons. Children sing solfège, play the keyboard, sing songs with lyrics, move to music, play rhythm and keyboard ensembles and participate in “music appreciation” activities (initially a non-analytical experience). They develop diverse musical skills without prematurely focusing on one instrument or style. This approach allows students to choose their future musical path when they are more physically and mentally mature. Music is a Language The method assumes music is a language children can learn naturally in the same way they learn their spoken and written language: we hear, we imitate, we speak and we read. You will find a parallel sequence played out in JMC classes throughout the world-children hear a melody or harmony, sing it in solfège, play it on the keyboard and then learn to read it. The aural awareness of four- and five-year-olds is more developed than their manual dexterity and visual skills. Therefore, the Yamaha approach for this age group focuses on aural training versus emphasizing piano technique and reading. While early lessons cover the basics of keyboard technique, technical study is more actively undertaken in upper- level courses when students are developmentally ready. Likewise, the introduction of reading and theory takes place gradually in a timely and contextual manner. When students are intellectually ready, it is explained in academic terms what they have sensed and experienced musically at a young age. Ear First The Yamaha Method employs “Fixed-Do” solfège (without altered syllables) in both ear training and keyboard activities. Fixed-Do enables a child to connect a specific pitch and syllable, such as middle Do (middle C), with a specific key on the keyboard. Aural training using Fixed-Do helps children internalize pitch, resulting in a strong relative pitch sense and, in many cases, perfect pitch. Consequently, in JMC classes one will observe students singing solfège by ear and eventually playing keyboard by ear. Solfège is the core of the Yamaha Method; students absorb this musical vocabulary and use it in both beginning and advanced courses. Solfège becomes each student’s first musical voice. In every class, teachers sing melodic patterns and chords that children imitate. Solfège sessions at the teacher’s piano account for approximately 15 to 20 minutes of a 60minute class. Through singing solfège, students begin to acquire a sense of pitch, rhythm, meter, harmony, form, phrase structure, key, articulation, dynamics and mood. By the end of two years in JMC, students have built a substantial vocabulary of solfège, having sung 50 melodies and numerous chord progressions using the I, IV and V7 chords in the keys of C major, G major, F major, D minor and A minor. Aside from developing musicianship, these solfège experiences prepare children to play in these five keys. In fact, children experience singing in a key for approximately one semester prior to playing in that key.